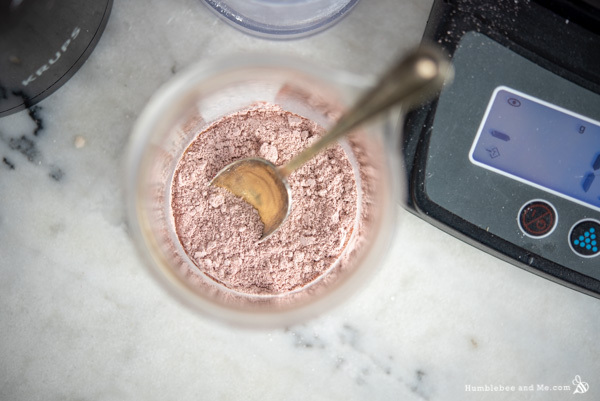 After that we’ve got a blend of pink and white kaolin clays, a rich medley of botanicals, some essential oils, and a few other things, like a gum for texture and preservatives. It’s a pretty decked-out face mask and there’s lots of room to have fun with the concept! 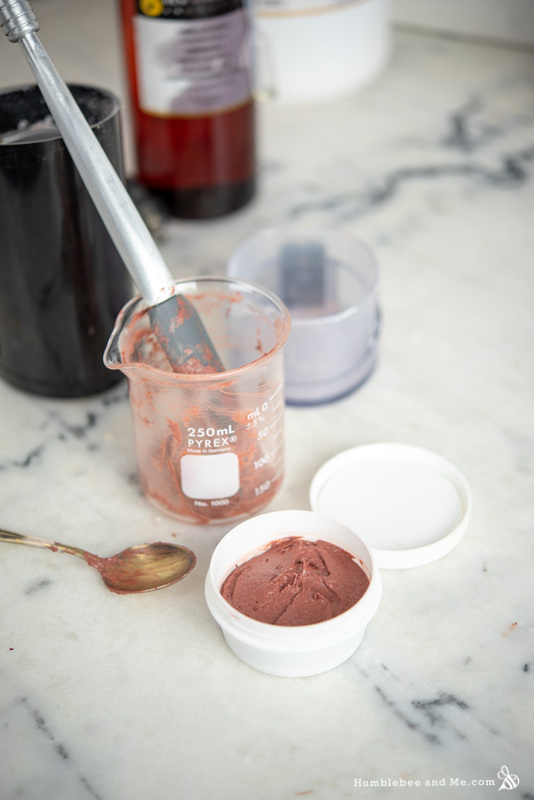 The part we’re focussing on is the dry ingredients and the camellia seed oil; we’re making a paste with the clays, some botanicals, and the oil so we’ve got a pre-moistened mask base that we can tart up as desired at the moment of use. I’ve chosen a blend of white kaolin and pink Australian clay—it’s mostly white kaolin as the pink Australian clay will dye stuff pink with very little encouragement. At just 10% there’s more than enough pink clay to make the entire mask a deep, dusty pink, but it doesn’t dye my skin. 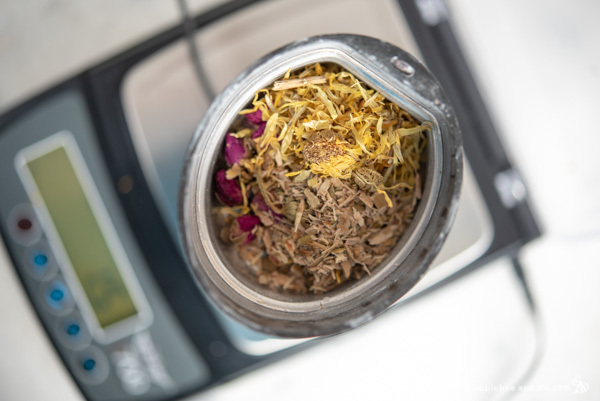 For herbs I’ve selected acne-fighting white willow bark, calming calendula, and fragrant rose petals. 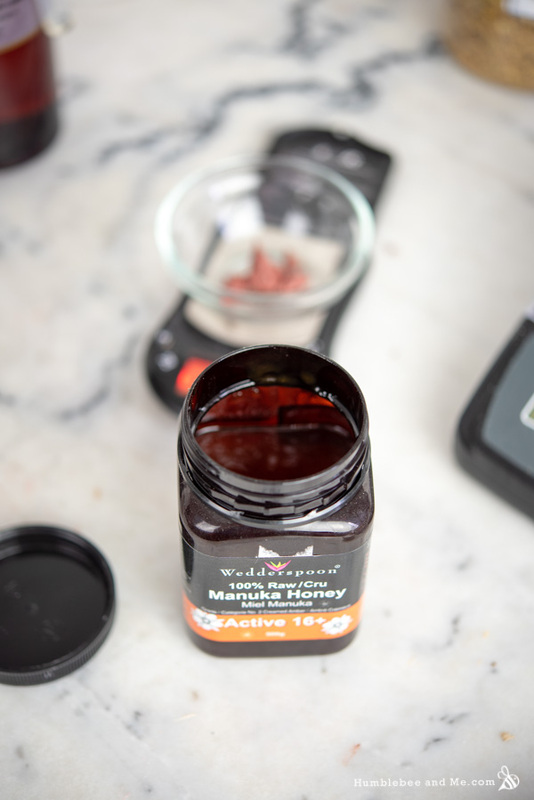 You can feel free to select botanicals you prefer, just make sure they’re clean and 100% dry. I don’t recommend using any more than the amount I’ve used, though you can definitely dial it back for a smoother mask. 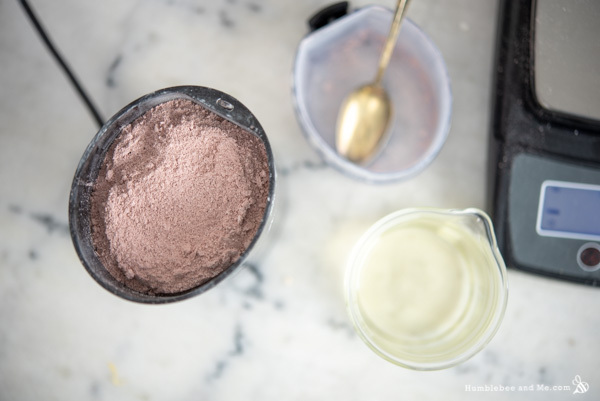 Once the dry ingredients and blended into a fine powder we’ll transform them into a rich paste with camellia seed oil, and from there you have a sort of mask concentrate. As with most store bought masks, the inspiration for this project is sold pre-hydrated and ready to go. 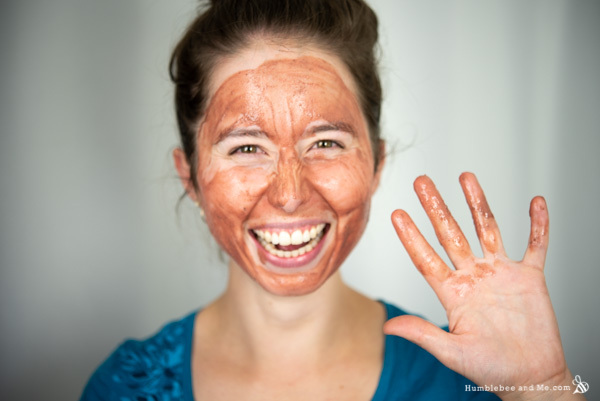 Unfortunately, clay face masks are full of ingredients that are notoriously hard to preserve, and this mask is no exception. It’s packed with things that are lovely for the skin like honey, clay, and botanicals—but these things are also very difficult to safely preserve, especially when they’ve been mixed together. It’s obviously possible to preserve such things, but given we don’t have professional manufacturing facilities and stability testing to ensure our products are safe, we’re keeping this mask water-free until the moment of use. The finished mask is unlike many I’ve used in the past; thanks to the high oil content and the hyaluronic acid it doesn’t dry down and get tight and uncomfortable. The pink colour is really fun, and the ground botanicals offer a bit of physical exfoliation. 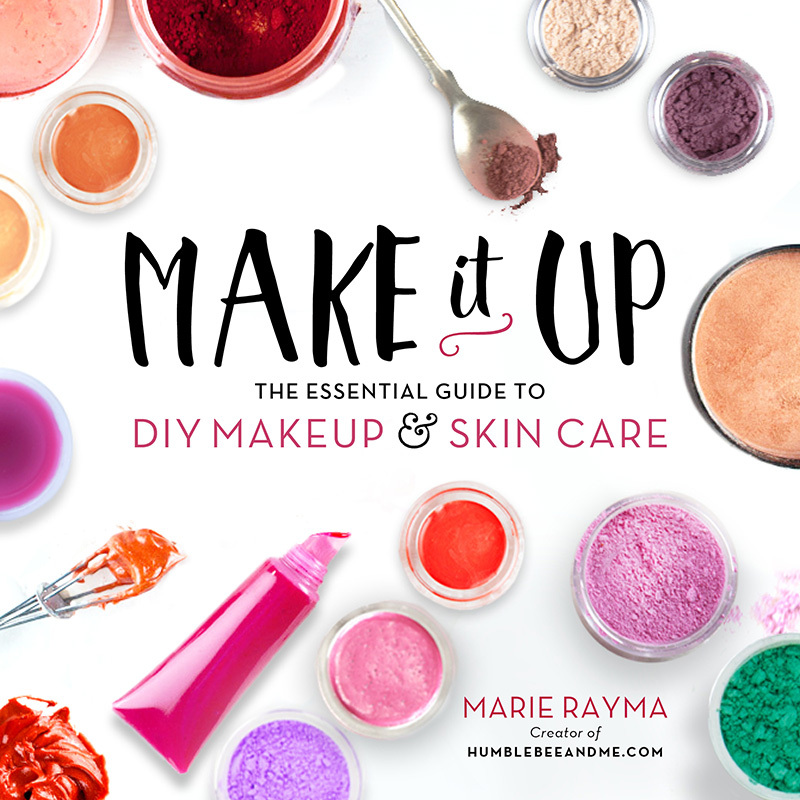 My face felt gently cleansed and lightly hydrated after use—not tight, red, or dry at all. I’m really enjoying this mask, and I hope you’ll give it a try! 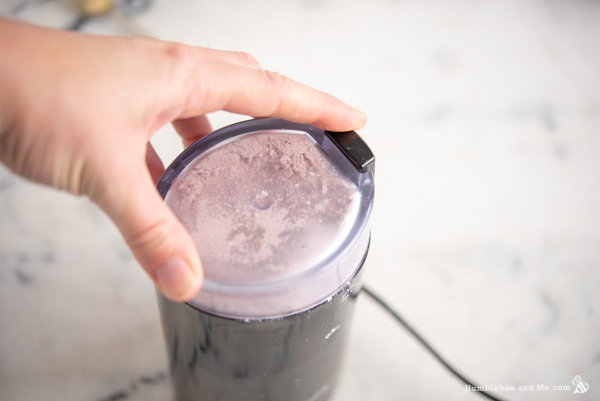 Weigh the blended phase ingredients into your DIY-only coffee grinder. Blend until you don’t hear any big bits of dried plant matter bashing around anymore—this will probably take about a minute. Leave the coffee grinder with the lid on to allow the dust to settle for at least five minutes before removing the lid. 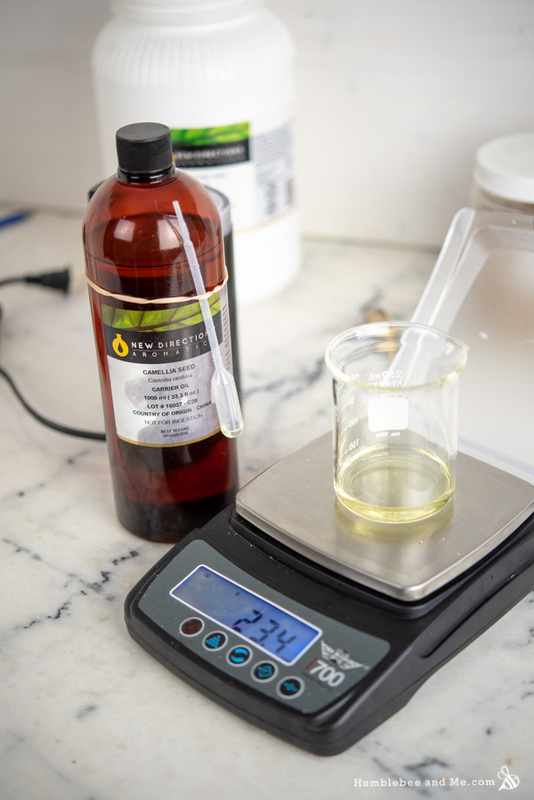 Weigh the camellia seed oil and vitamin E oil out into a medium sized bowl or beaker. 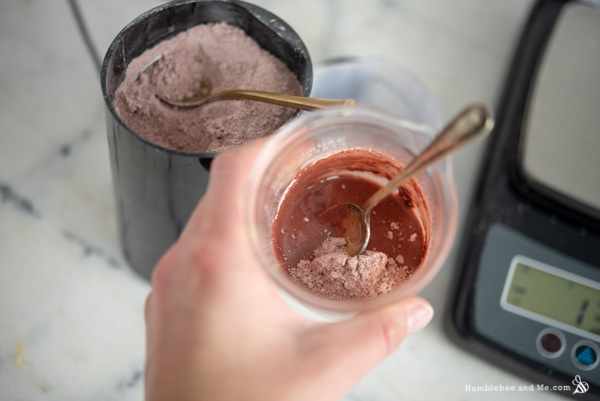 Add the clay mixture, a spoonful or two at a time, stirring between additions. 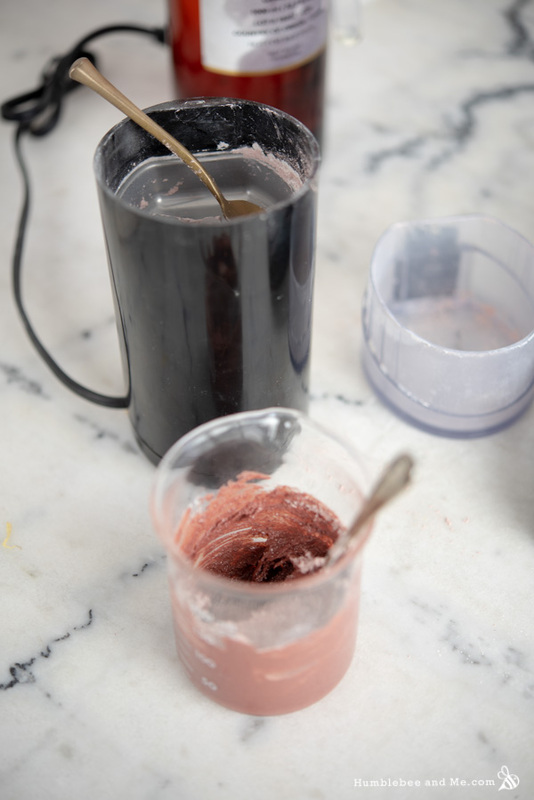 You’ll end up with a stiff, pinkish red paste once you’ve incorporated all the clay. 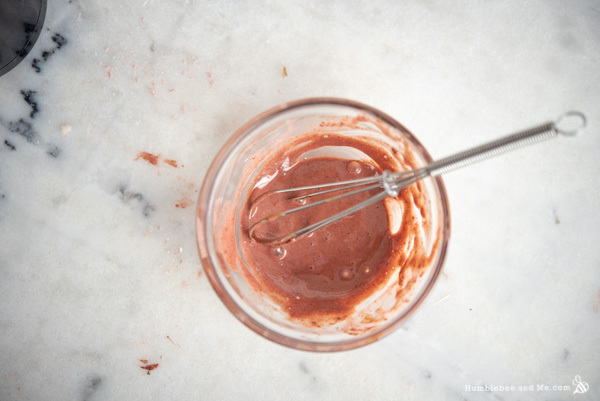 Transfer the clay paste to a 60mL / 2oz jar. Now it’s ready for use! Keep reading for different use instructions. 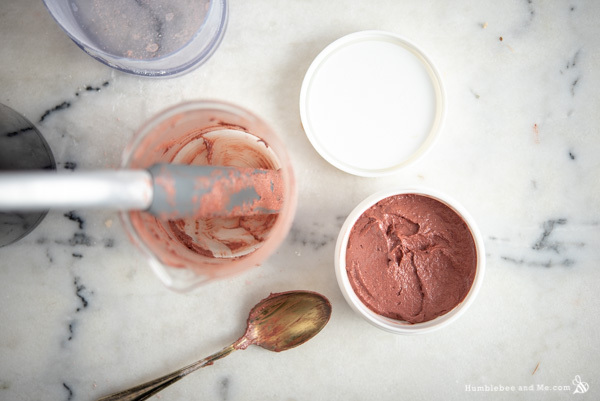 Because this clay paste does not contain any water, it does not require a broad-spectrum preservative (broad spectrum preservatives ward off microbial growth, and microbes require water to live—no water, no microbes!). Be sure to keep it dry to ensure it lasts as long as possible—don’t let any water get into the container and it should easily last a year. 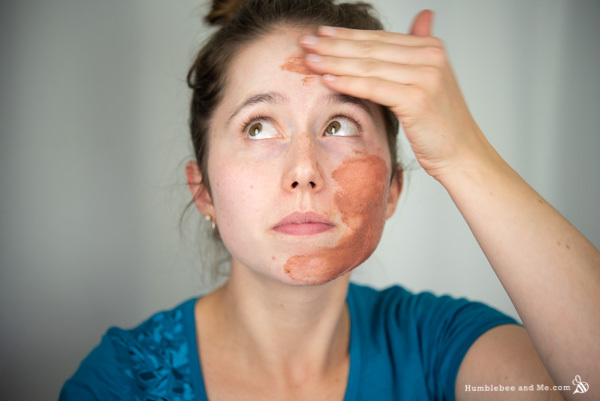 You can use this clay mask base many different ways. You can use it as-is. It is very scrubby this way, so if you choose this method I’d recommend doing this once a month or less. Not recommended for sensitive skin. It would make a nice body scrub, too. Using it this way is most in keeping with the product that inspired this mask. You’ll need some raw honey (I used manuka, but any sort of raw honey will be lovely), and a hyaluronic acid/rose hydrosol blend. If you made my Rose Silk Hydrating Sheet Mask, the liquid from that is perfect! Otherwise, you can make a simple toner and use that (scroll down for a simple recipe). If you don’t have any hyaluronic acid, you could also use a few grams of a store bought HA serum if you have one. Whisk everything together and let soak for about ten minutes before applying (this gives the botanicals a chance to soften up). Gently spread over the face, leave to dry for twenty minutes, and then rinse off. Follow up with your favourite face cream or serum. Voila! These amounts will give you enough for two masks. The mixture needs to be used quickly, so mask with a friend, or halve it. If you have leftovers you can cover them tightly in cling film and store in the fridge for two days. 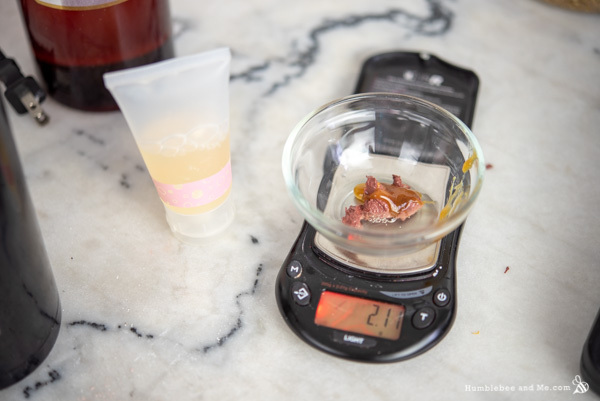 Weigh the heated phase ingredients into a small heat-resistant glass measuring cup or beaker. Stir to combine and transfer to a 60mL (2 fl oz) bottle. 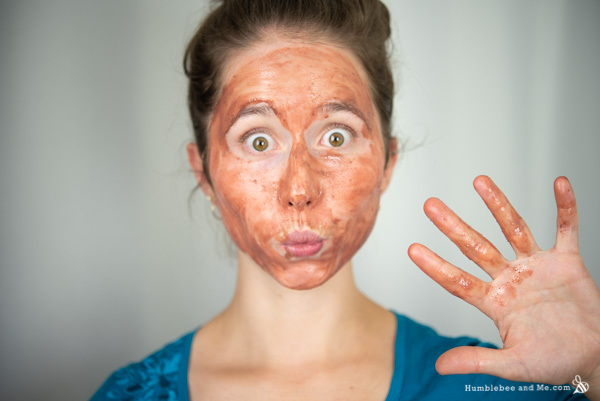 Now you have a hydrating rose toner and some liquid for making this mask with! As I’ve provided this recipe in percentages as well as grams you can easily calculate it to any size using a simple spreadsheet as I’ve explained in this post. 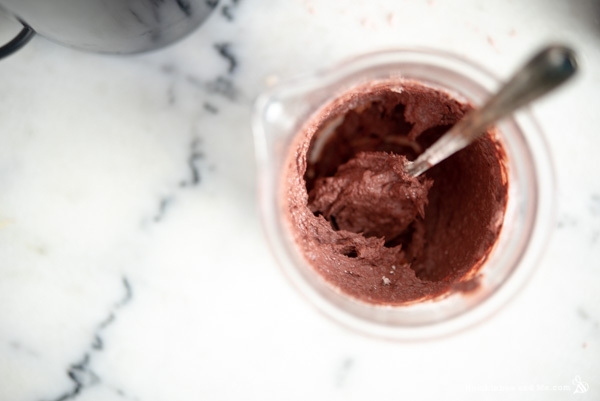 As written in grams this recipe will make 50g clay paste. You can try different lightweight clays like French green in place of the Australian pink clay. Do not use bentonite or rhassoul. You could also use more white kaolin. If you want a less scrubby mask, or if it’s what you have, feel free to use pre-powdered versions of the herbs. You can also mix up the herbs to better suit your skin, or dial back the amounts, making up the difference with more kaolin clay. You can substitute another lightweight oil like sweet almond, grapeseed, or sunflower seed for the camellia seed oil. The white plastic jar was gifted by YellowBee. The hyaluronic acid was gifted by Pure Nature. Enjoy! I love how this mask doesn’t get all tight and dry like many masks do—there is just far too much goo in here. Yay goo! Could i use algin powder in this, if so what percentage? Thanks!! I’m afraid I’ve never worked with algin, so I don’t have any personal experience to share. I’d recommend giving this FAQ a read 🙂 Supplier recommendations are 1% or less, so I’d probably start around 0.2%. Eeeek indeed! I’d hope that was a bathtub full of mask for that price lol. thanks for the recipe and i cant wait for my ingredients to arrive next week ! Just a question though . I read from your site that clays are difficult to preserve . But this clay paste can last for a year even without preservative ? What kind of concoction that would make clays difficult to preserve ? Is there a way I can make this a “peel off mask” ? As in, after 10-15 mins, I can peel it off in one piece? Or do you have a recipe for that?